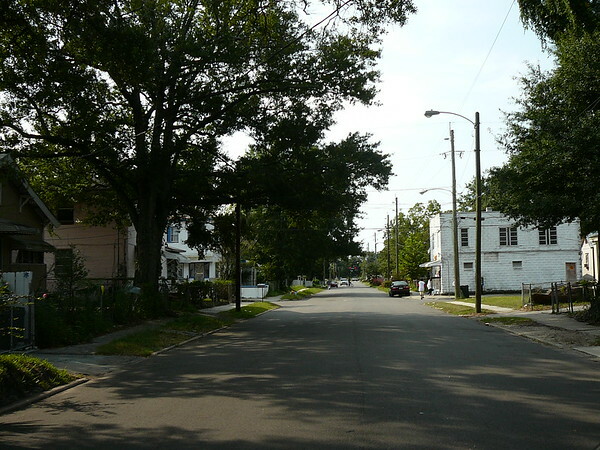 Developed during the first decade of the 20th century, New Town is a traditional African-American working class community and the focus of a major neighborhood revitalization initiative. 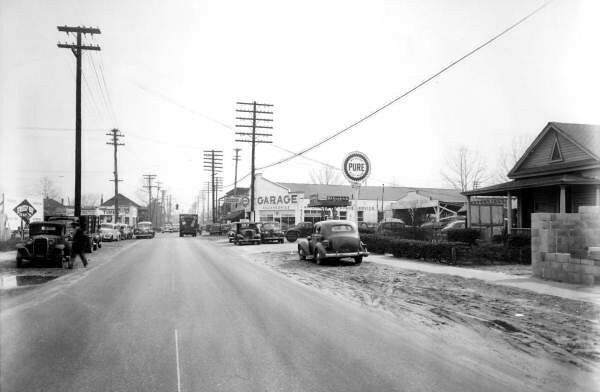 During its early years, the neighborhood enjoyed considerable growth due to a streetcar line that ran down Kings Road and the presence of multiple rail lines throughout the area. Surrounded on the West, South and East by industrial uses, the majority of the community was employed in the industrial and railroad sectors. 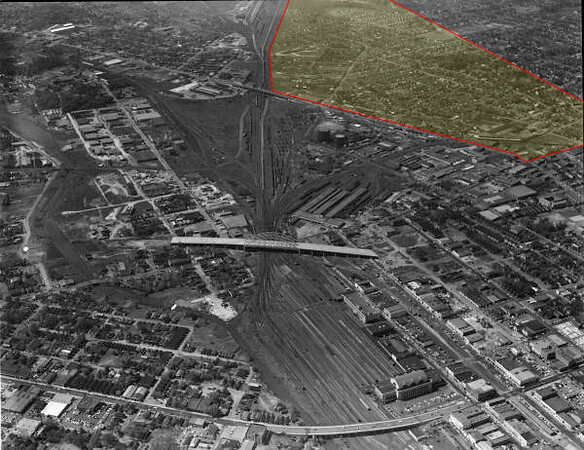 The area highlighted in the historic aerial illustrates the location of New Town in relation to downtown Jacksonville's railroad terminal. 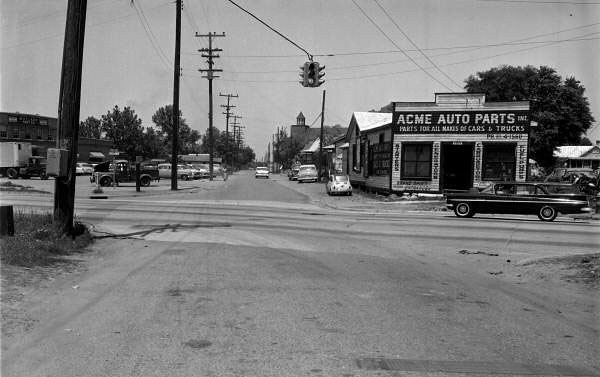 Looking west at the intersection of Beaver and Acorn Streets in 1959. New Town's former W.H. Clark Fruit Company citrus packing house can be seen to the right of the Beaver Street viaduct. The S-Line crossing Beaver Street in New Town in 1942. 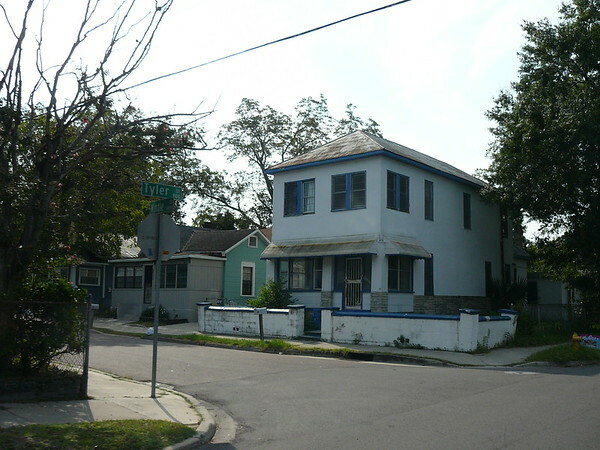 The residential structures recorded are predominantly of the shotgun or frame vernacular styles. Frame vernacular refers to the common wood frame construction techniques employed by self-taught builders. 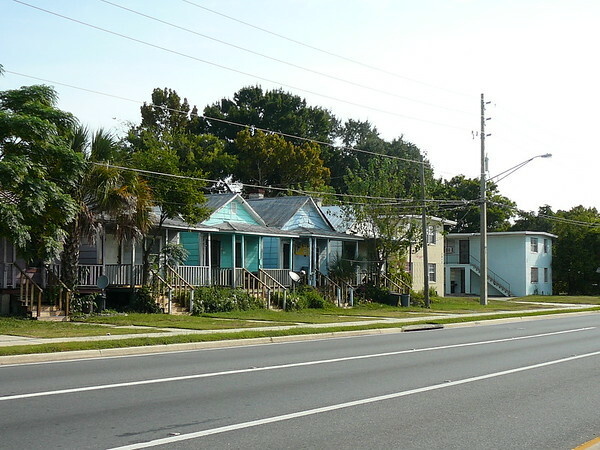 This is the prevalent style of residential architecture in Florida. These buildings are typically one or two stories in height and display a variety of footprints and forms. Porches are a common feature of this style. 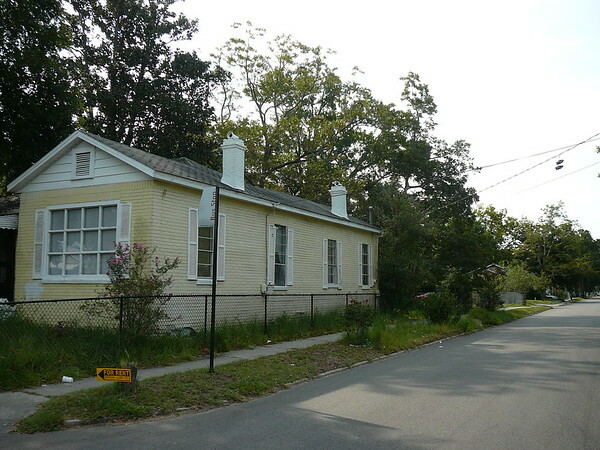 Buildings of this style either have gable or hip roofs. 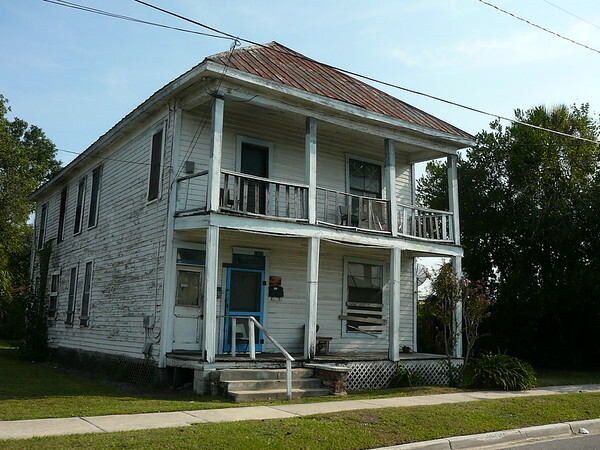 Shotgun typically refers to a modest single-story cottage one room wide and two or more rooms deep. 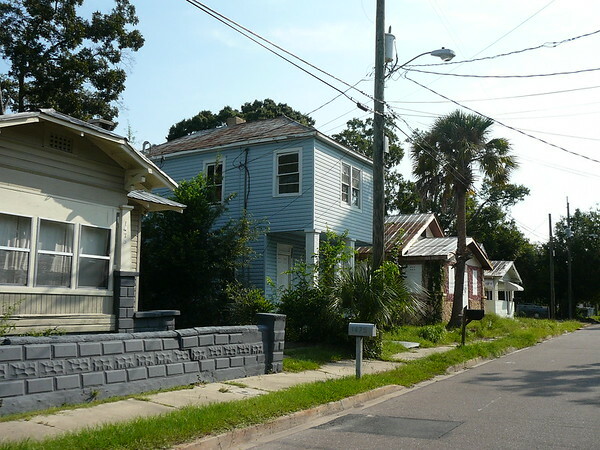 Houses in this style typically have a steeppitched roof with a front-facing gable. Front porches are a common feature of this style. Most shotgun dwellings are very simple structures with little embellishment. 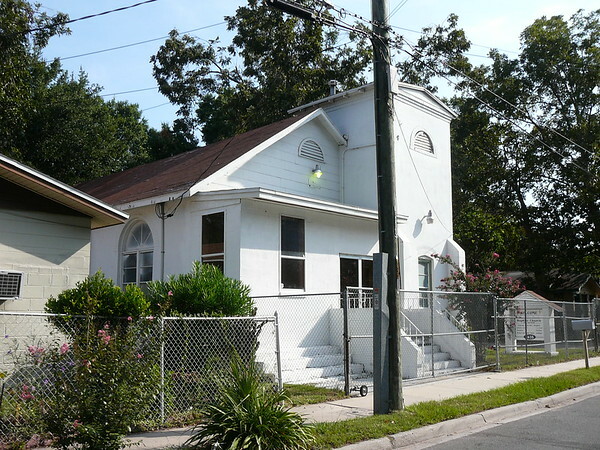 The West Union Missionary Baptist Church was designated a local historic landmark in early 2000. The church was founded in 1900, with the present sanctuary constructed in 1938. The church is one of the earliest religious organizations in the New Town area. Looking down Acorn Street in 1959. 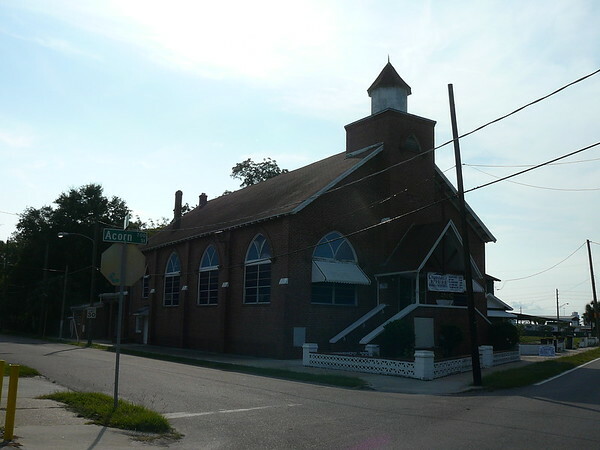 The West Union Missionary Baptist Church can be seen in the background. New Town is home to two public schools; Eugene Butler Middle School (above) and SP Livingston Elementary School, which is a few blocks to the north of Eugene Butler. During the early 20th century, the site of Eugene Butler was occupied by a sawmill known as the Crosby-Knighton Lumber Company. 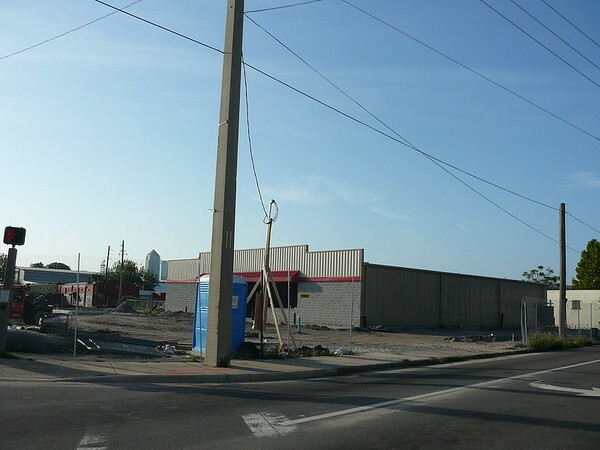 Located on the corner of 3rd & Pearce Streets, this site will be the location of Success Park. Saying children needed a safe place to play in Jacksonville's New Town community, city officials, college leaders and kids took the first step to that goal by breaking ground Thursday for a nearly 2-acre park and playground on the campus of Edward Waters College. Success Park is a collaborative initiative between EWC and the city for the New Town Success Zone program. The Success Zone is inspired by The Harlem Children's Zone, a project in Harlem that flooded the community with services touching on everything from health care to education with the goal of improving graduation and college attendance rates. The city is paying for the park's $175,000 cost, and EWC will maintain the park and its equipment. 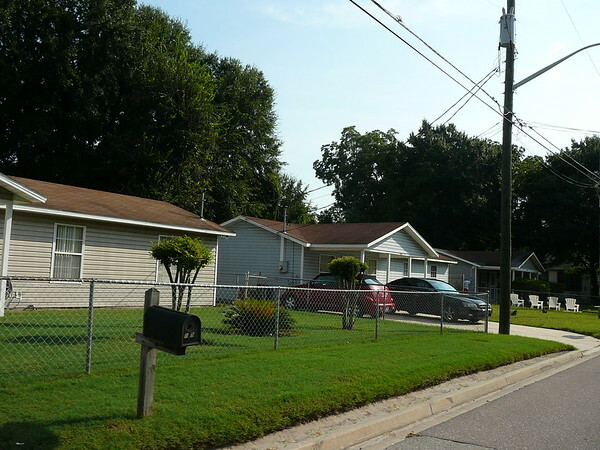 Located on the west side of New Town, the College Gardens subdivision features brick homes dating back to the late 1940s. 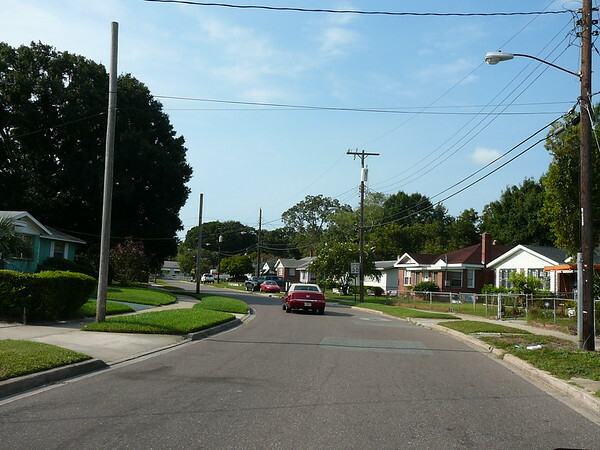 Tyler Street is a major secondary roadway that connects the residential heart of New Town to Kings Road (north) and Beaver Street (south). 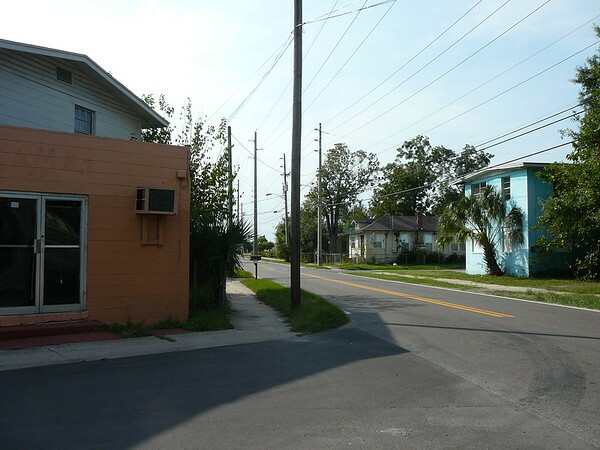 Tyler Street's characteristics include a fairly wide path of pavement between curbs, sidewalks and a mix of uses within a walkable setting. 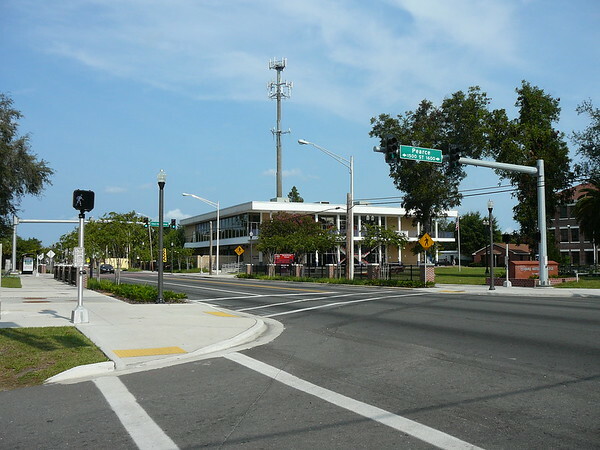 Through coordination with the City of Jacksonville, an opporunity exists to make this a context-sensitive corridor that includes bike lanes, street trees and better lighting to promote a stronger sense of place within New Town. Edward Waters College dormitories along Tyler Street, near Kings Road. 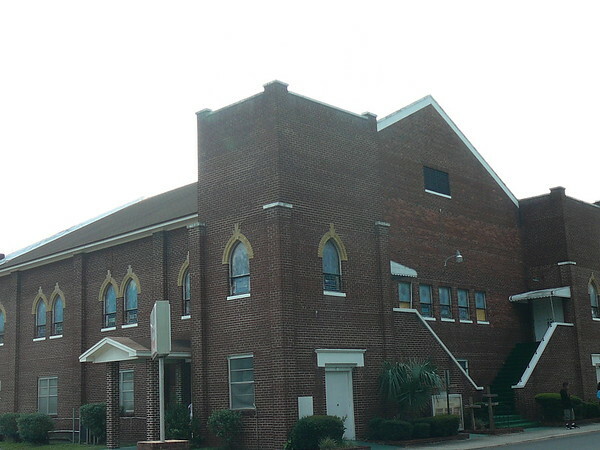 Tyler Street's New Bethel AMEC's sanctuary dates back to 1941. 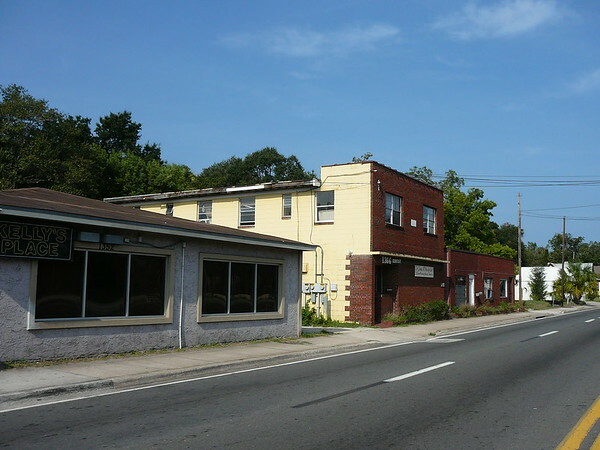 Looking down Tyler Street; The small mixed-use building in the background was constructed in 1932. 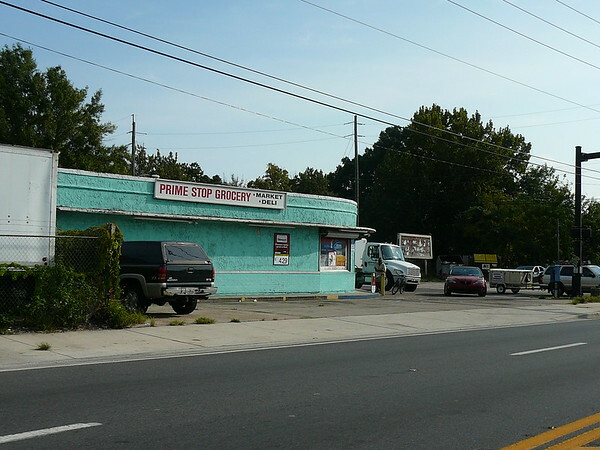 The Prime Stop Grocery anchors this small 1945-era Art Deco storefront at the intersection of Tyler and Beaver Streets. 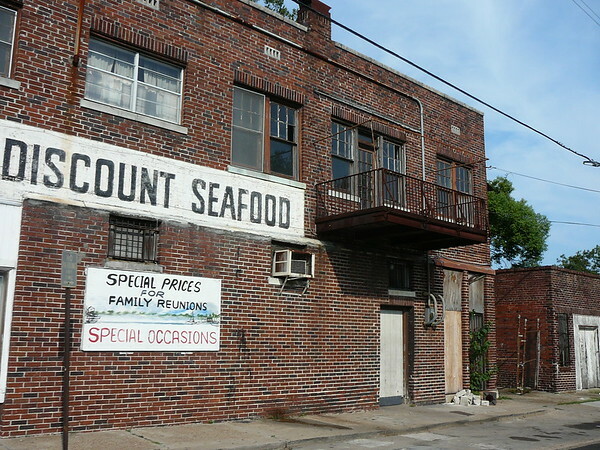 The industrial and commercial buildings built prior to 1950 are predominantly of the masonry and industrial vernacular styles. Masonry vernacular is defined as the common masonry construction technique of self-taught builders. 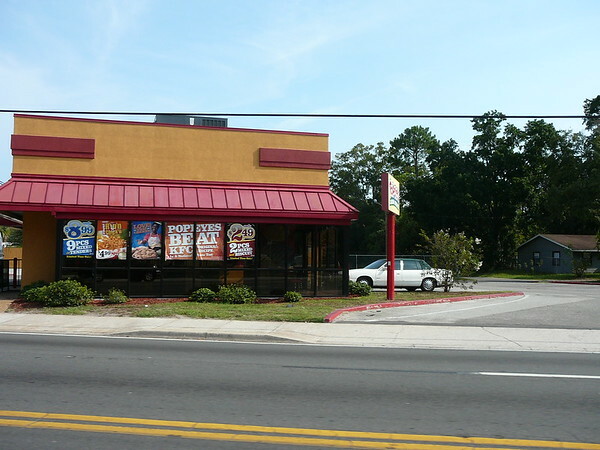 This style of construction is most commonly associated with commercial building types. A variety of materials are employed in this style, though brick and concrete block are the most common. 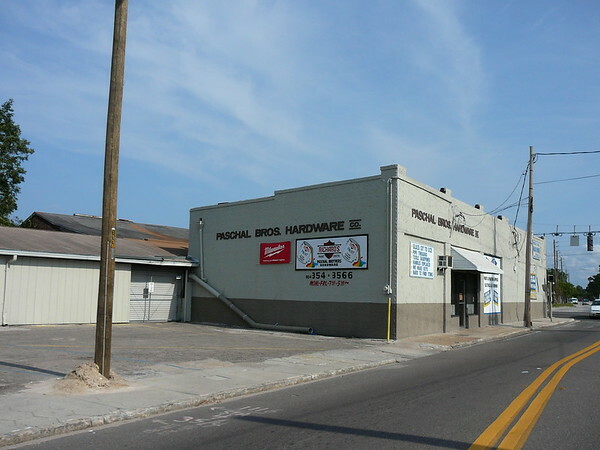 Industrial vernacular refers to buildings with no formal architectural style. 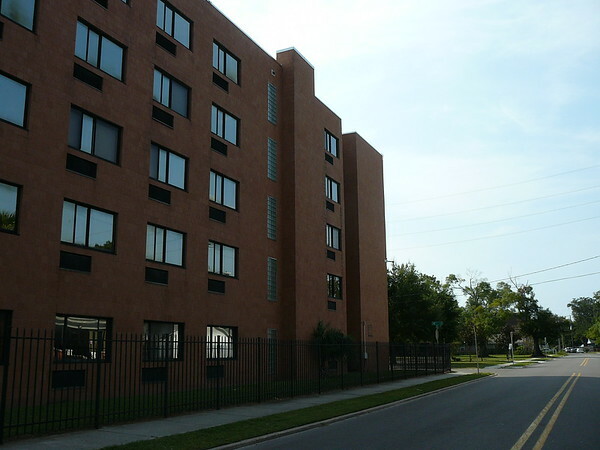 Buildings of this type are constructed explicitly for industrial and commercial uses. This 1926-era storefront on Fairfax Avenue is a reminder of an era when New Town had a higher population density that supported a mix of uses within a compact walkable setting. 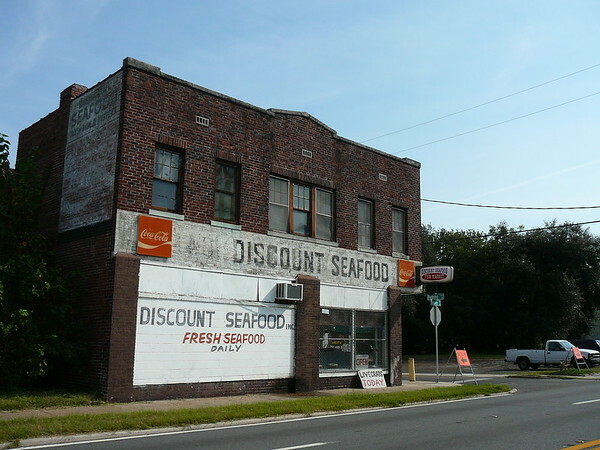 Dating back to 1929, this brick building houses Discount Seafood, a neighborhood fish market, at the intersection of Beaver and Rushing Streets. 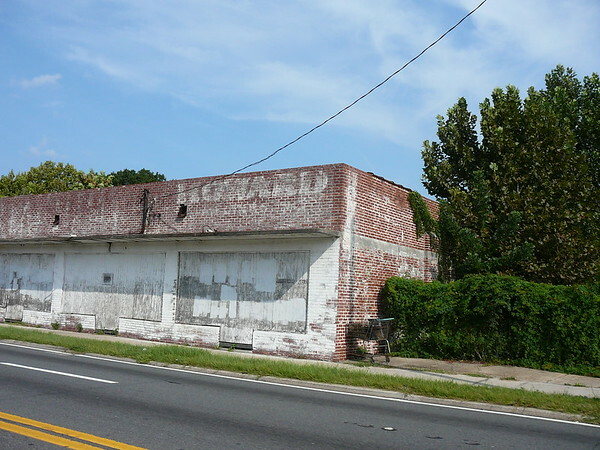 Now the headquarters of Load King Manufacturing, this building was once a warehouse for the Winn & Lovett Grocery Company. 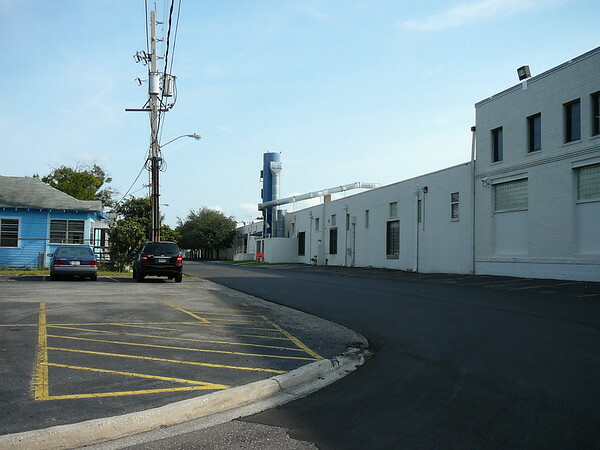 Load King Manufacturing is the leading provider of turnkey modular stores to the foodservice industry in the United States. 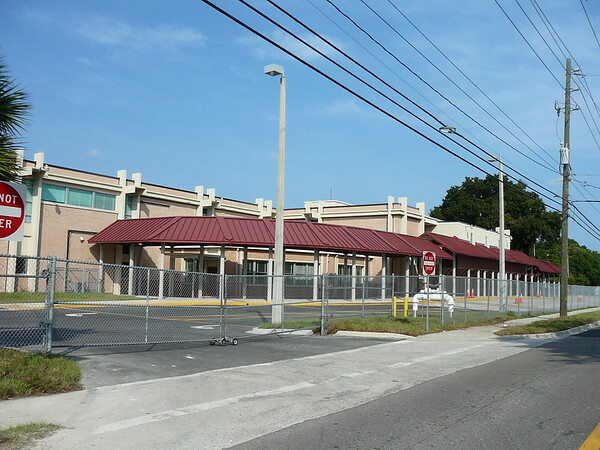 Beginning in 1995 with building and installing over 600 food courts for Winn-Dixie supermarkets through being the leading supplier of licensed stores for Starbucks and others, Load King has manufactured and installed more than 5,000 turnkey modular stores throughout the United States. Load King has been family owned and operated since 1973. 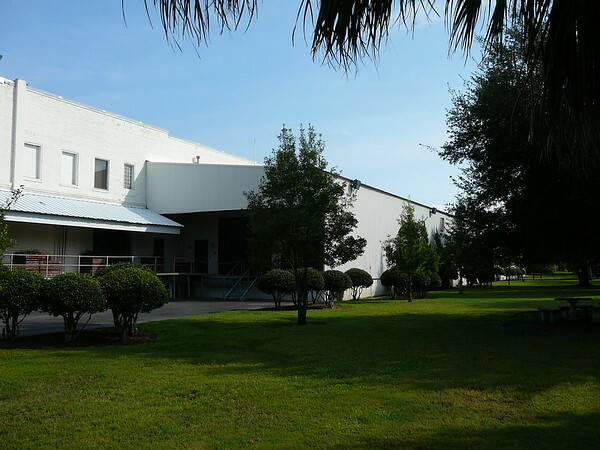 Our offices, manufacturing and warehousing facilities are all located in Jacksonville, Florida in several buildings comprising 300 thousand square feet. We have skilled workers and equipment for all fixture manufacturing including laminate and wood finished millwork, stainless steel counters, sinks, etc., steel framed cabinetry, solid surface counters, graphic elements and more. We are certified in the practice of Lean manufacturing assuring high quality and price competitiveness. 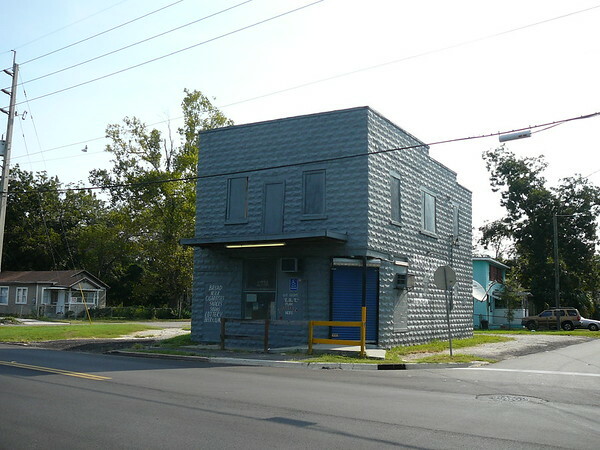 Additionally, Load King is a cornerstone of the community in the economically troubled New Town section of Jacksonville. 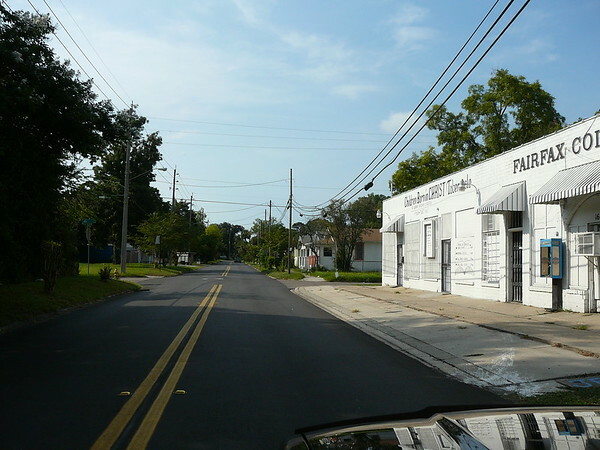 The company operates out of renovated circa 1919 buildings in an enterprise zone. 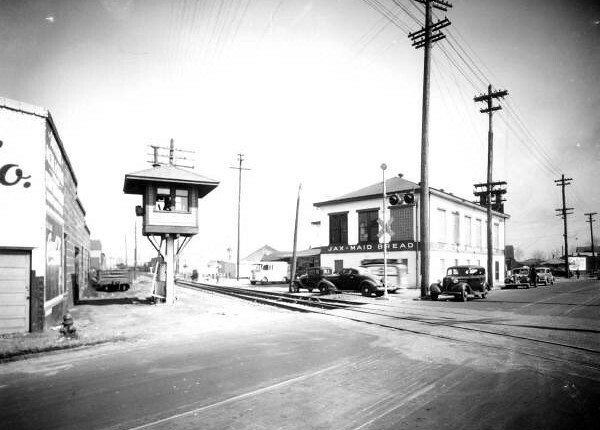 Kings Road crossing the S-Line in 1942. Kings Road was originally constructed during the British period of occupation between 1771 and 1775. 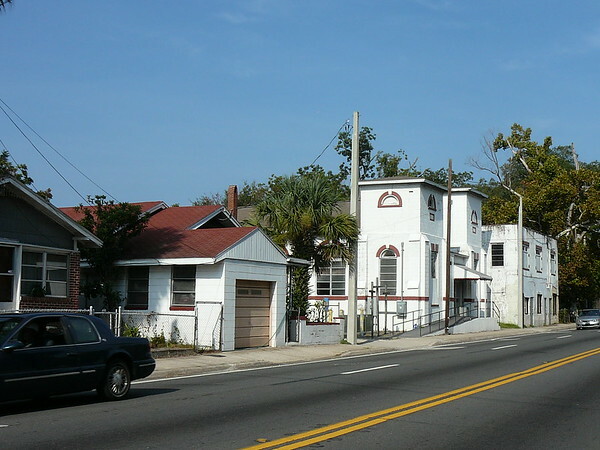 The road extends between Savannah, Georgia and New Smyrna, Florida. 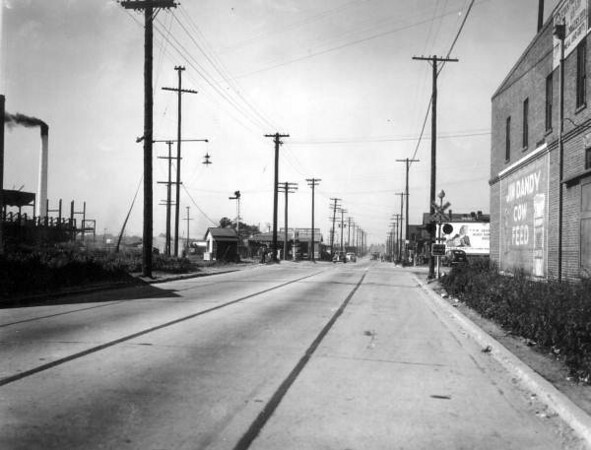 Early growth in New Town and the Kings Road corridor was stimulated by a streetcar line on Kings Road that was extended to Mason Park in 1904. 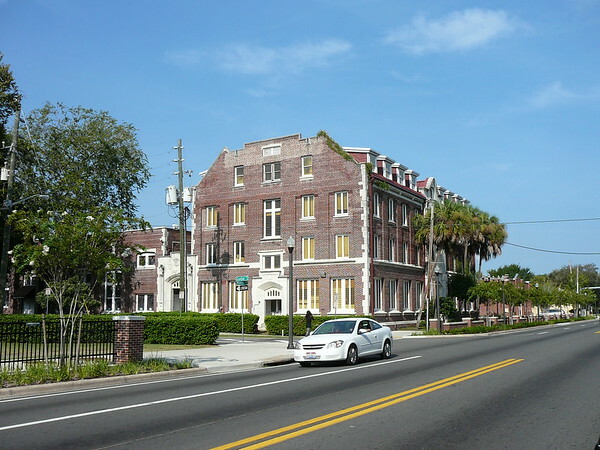 Through the early 20th century, Kings Road developed into a walkable commercial corridor with Edward Waters College as its centralized anchor. 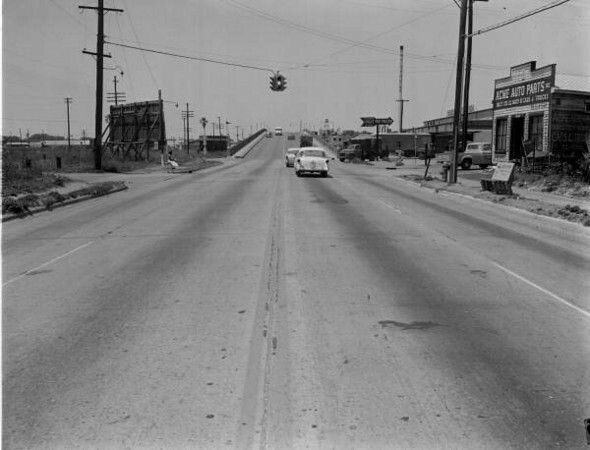 In the mid century, the corridor began to decline partially due to the construction of the 20th Street Expressway allowing traffic to bypass New Town, and the widening of Kings Road from two lanes to four prior to 1971, eliminating on-street parking in the process. 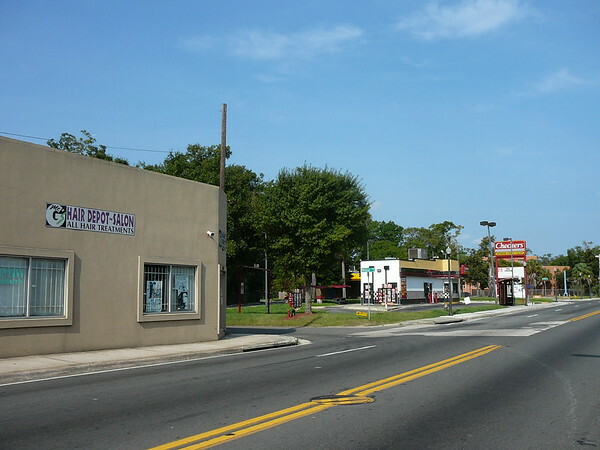 Today, the Kings Road corridor still serves as the major transportation route for the neighborhood. 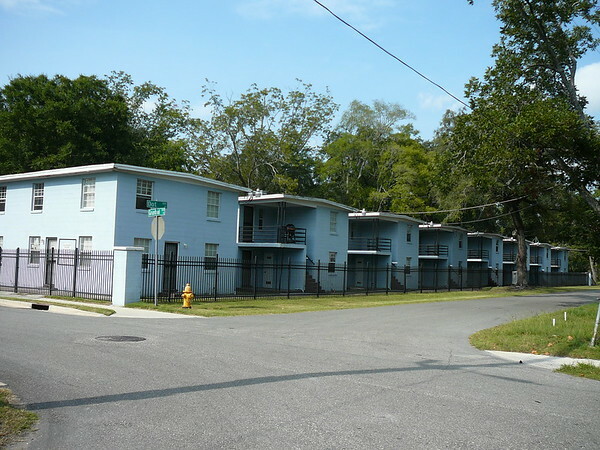 Future redevelopment opportunities focus around the growth of Edward Waters College. 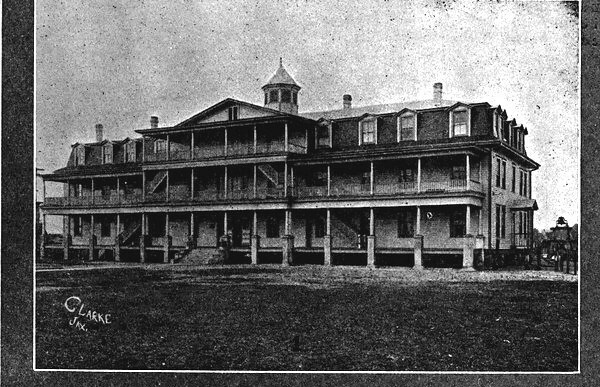 Edward Waters College during the late 1800s. 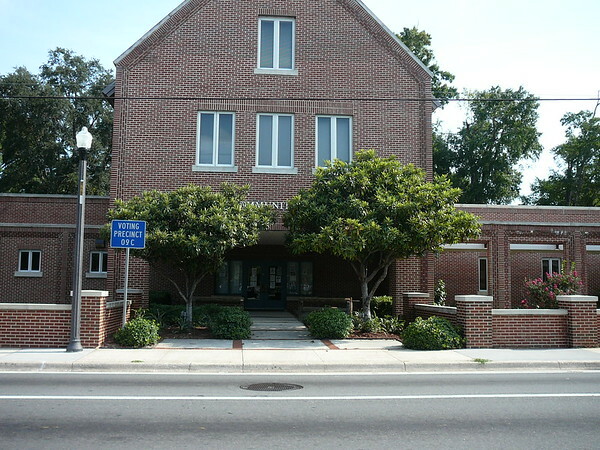 Edward Waters College is the oldest institution of higher education for African-Americans in the state, and the oldest institution of higher education in the City. Although originally located on Beaver Street before the Great Fire of 1901, the College built its first building, Salter Hall (now demolished), along Kings Road in 1908, and later built Centennial Hall in 1916. Centennial Hall was designed by the firm of Howell and Stokes, whose architects also designed Woodbridge Hall at Yale University, St. Pauls Chapel at Columbia University, First Congregational Church in Danbury, and the Stock Exchange Building in Baltimore. Edward Waters College presently has an enrollment of approximately 1000 students, and offers degree programs in business administration, hotel management, psychology, religion, philosophy, communications, sociology, physical education, biology, criminal justice, gerontology, and political science. 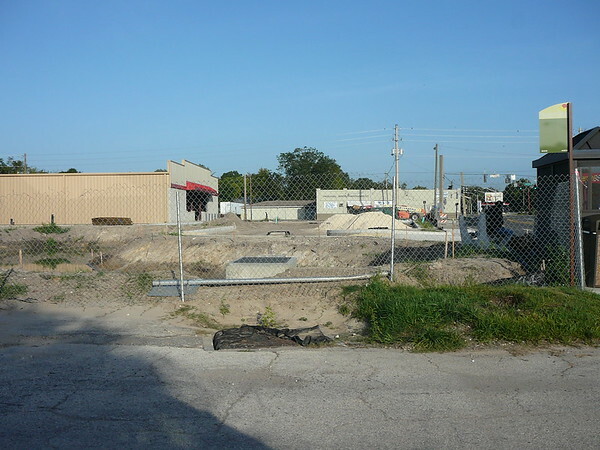 A suburban-oriented Family Dollar under construction at the intersection of Kings Road and Myrtle Avenue. 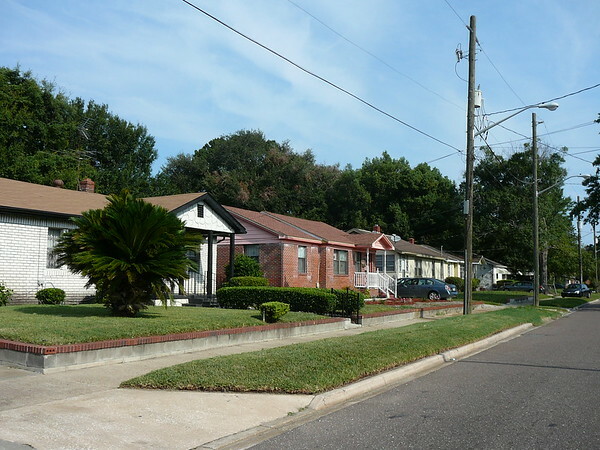 In a historical walkable community like New Town, the City of Jacksonville could possibly be the neighborhood's worst enemy. 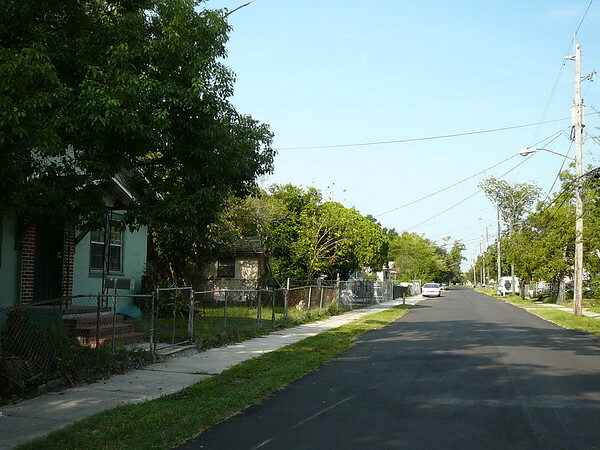 Like many areas of the urban core, new construction is incompatible with existing development due to large setbacks and lot coverage requirements allowed by the City. 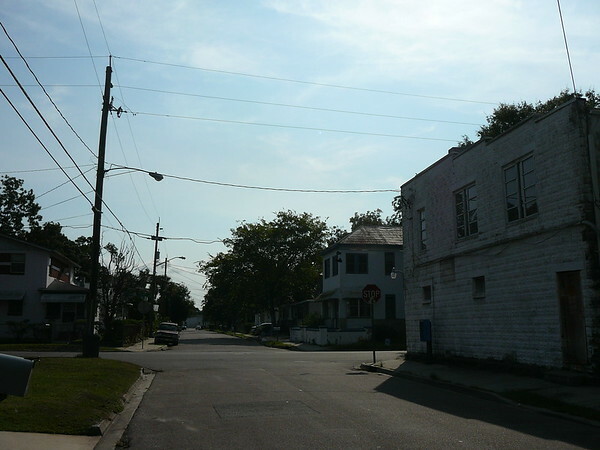 With every new incompatible development, New Town loses a little more of its historical character. 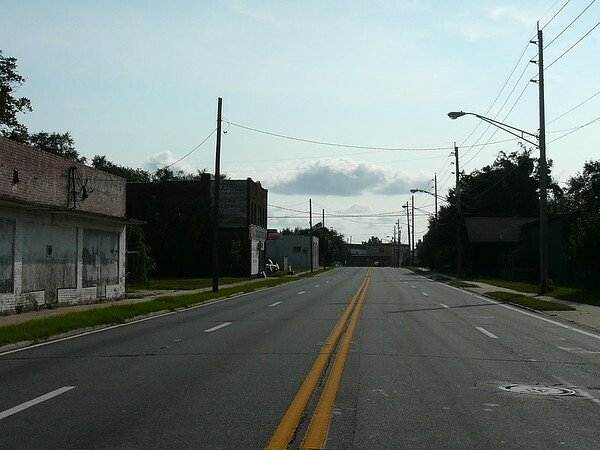 The City of Jacksonville's S-Line ROW could eventually become a commuter rail and bike trail corridor bringing economic revitalization and job creation to New Town. Approximately 13 to 21% of New Town residents rely on public transportation to journey to work. The addition of the 2030 Mobility Plan's commuter rail line along the S-Line corridor should create significant accessibility and economic opportunities for New Town residents, college students and businesses. 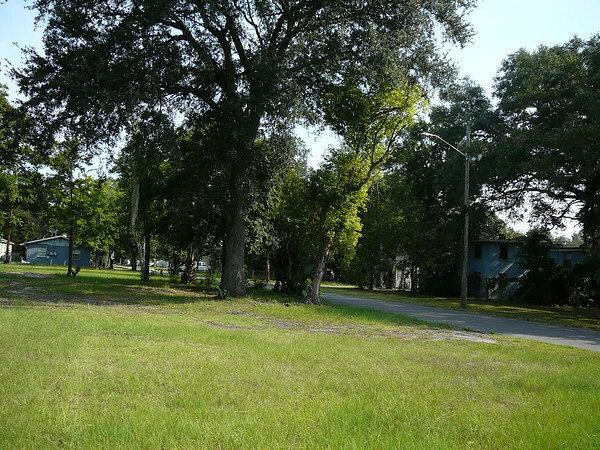 A portion of the future S-Line, a recreational trail extending from Myrtle Avenue to the CSX railroad behind Norwood Plaza, has been constructed by the Jacksonville Housing Authority as part of the HOPE IV projecti. 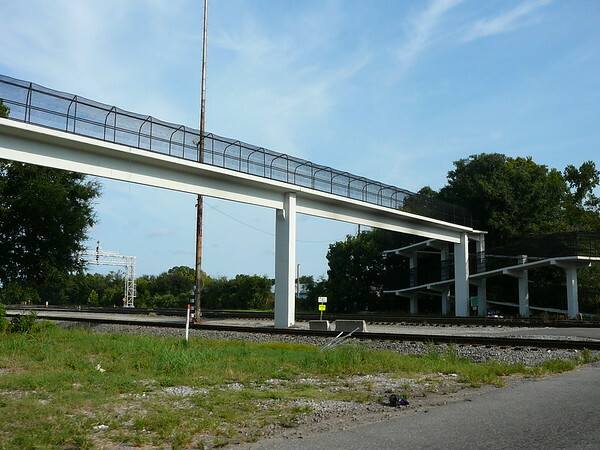 The S-Line is an urban rail-to-trail project planned for Jacksonville. This trail is sited on an abandoned stretch of CSX railroad Right-of-Way (ROW). The width of this 4.3 mile trail will be sufficient for pedestrian and bicycle traffic. The intention of this trail is not to create a destination recreational trail, but rather to offer residents of the surrounding neighborhoods an alternative to vehicle-dominated streets. 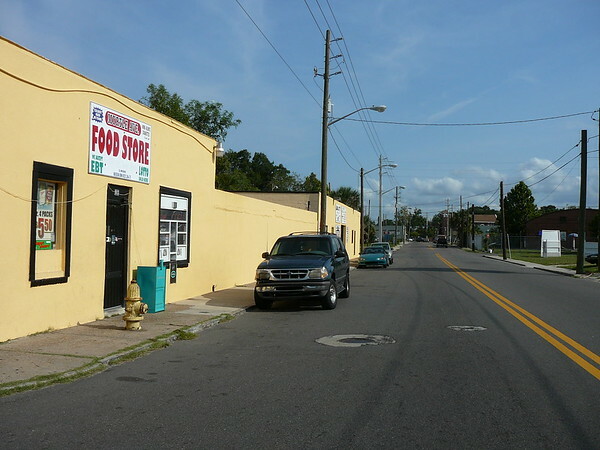 New Town is located west of downtown Jacksonville between Kings Road, Myrtle Avenue, Beaver Street and CSX's Moncrief Yard. Article by Ennis Davis. Historical photos courtesy of Florida State Archives.